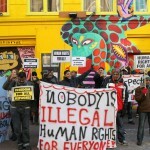 To stop the trend of illegal speed-evictions, the Amsterdam squatting groups are about to sue the state, and made a call out to other groups of squatters for collecting cases of speed-eviction. Duivendrecht, squatted on Saturday, January the 25th, and speed-evicted 10 days later. Again, two of the occupants were arrested and released without charges. The anti-squat company ‘Ad Hoc’ immediately placed one person to prevent a re-occupation. In both cases, the police hired the services of Seon, a private locksmith company, a way cheaper technique than deploying anti-riot and BRA-TRA units. Besides speed evictions, since last summer no real ‘eviction wave’ took place in town: anti-riot units have not been seen during evictions while regular police is sent to take back squatted houses. In the last months some buildings had been left vacant by the squatters a few weeks after receiving their 8 weeks eviction notice: Karspeldreef 2 in Bijlmer was returned to Rochdale at the beginning of February; ‘The Bank’ on the Oosteinde 15-17, squatted on October 13th, and owned by the Luske family, was left at the end of January; Madurastraat 16, already squatted for 12 years, was given back to the owner on the second week of January. The Plantage Middenlaan 64, owned by the King of Morocco, and squatted at the beginning of September, remained squatted until the end of October. 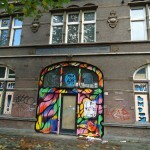 After 8 months of occupation, on January 22nd the Plan B squat on the Nieuwe Looiersstraat 84h, was evicted by regular cops. These easy evictions did not manage to break down the squatters. 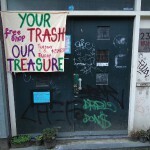 While Rochdale, Eigen Haard and other speculators continuously attempt to turn each street into a money machine, Amsterdam’s urban pirates keep on seizing empty properties and turning them into lively and liveable spaces. 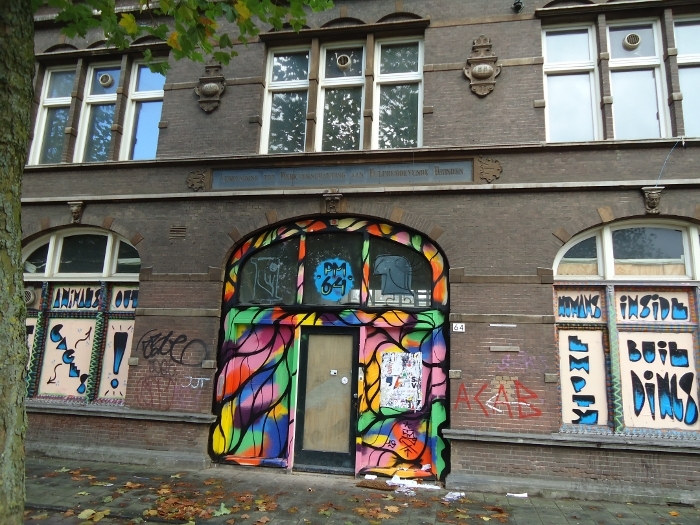 A first time squatted in October 1995, Zeeburgerpad 22 was re-squatted for a third time on November 17th 2013. Since March 2013, squatters were gone. A new owner appeared but nothing was happening with the building, as for many other properties in the Zeeburgpad/Cruquiusweg area. Evicted squats, anti-squatted buildings, empty plots are numerous in this grim neighborhood. 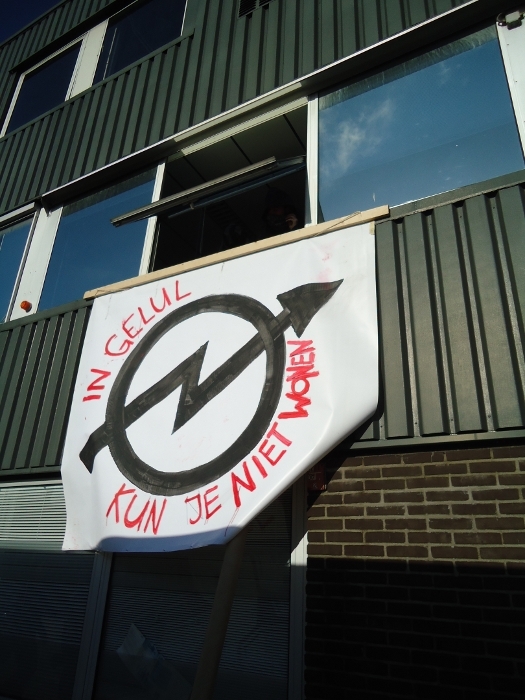 The ‘We are here’ group at the Vluchtkantoor, on the Weteringschans 109 was evicted on December the 1st. 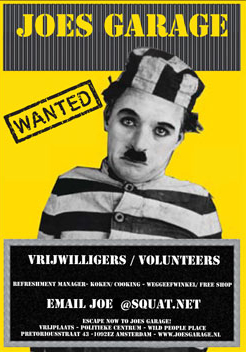 The mayor relocated half of the group in a temporary shelter, which is in fact a former prison on the Havenstraat, while the other half was left on the streets. 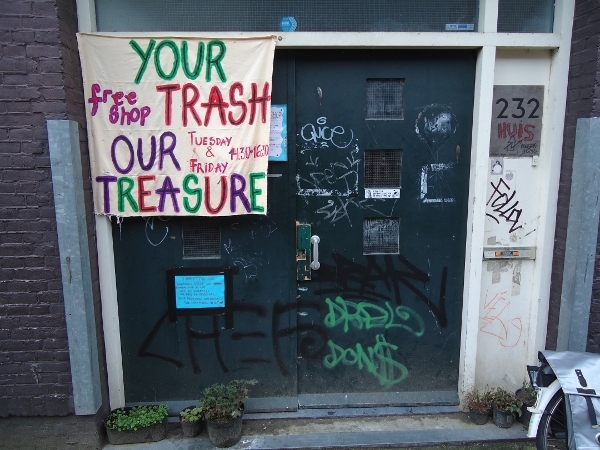 After finding hospitality in various social centres and churches, on December 13th the group squatted a former garage in Amsterdam Zuidoost (Kralenbeek 100), owned by the City of Amsterdam. They are now using the space not only for living, but also for moving forward with their political struggle. Visit them and bring support to their cause! On the 5th of January the Plantage Middenlaan 72 ground floor and first floor were successfully squatted. 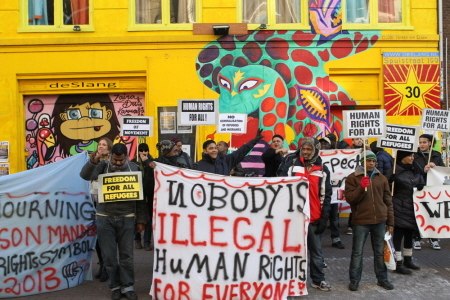 On Saturday, January the 18th a new squat was opened in the Bellamybuurt, on the ground floor of Van Effenstraat 2. The new house project named ‘eFFi’ was created under the slogan “Better to renovate through squatting than to destroy through ownership.” The apartment is owned by the housing corporation Rochdale, and is part of 5 former social housing blocks that are now being transformed into luxury apartments, to be sold on the free market. The squatters received much support from the neighbors. 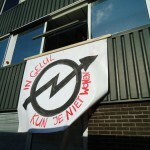 Next to the speed-evicted Ellermanstraat 31, the office building at Ellermanstraat 33 was also squatted on February the 1st. 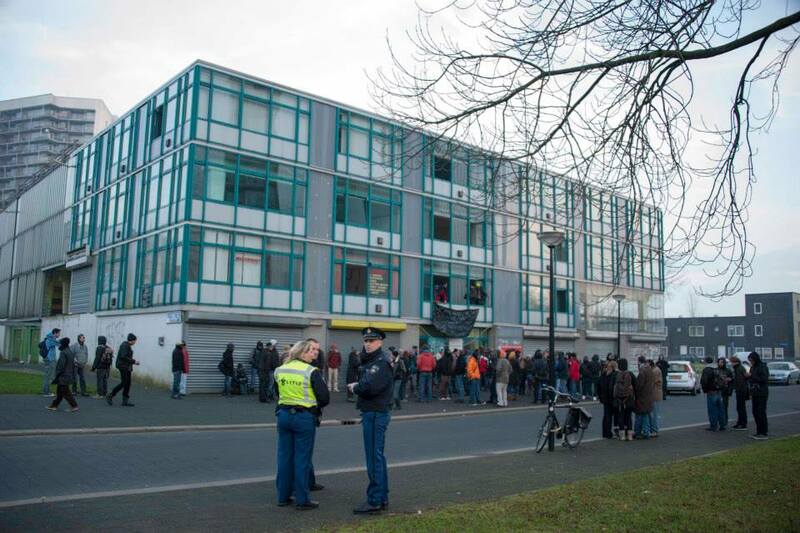 The day after, the first floor of the Klaprozenweg 48, in Amsterdam Noord, was successfully squatted. 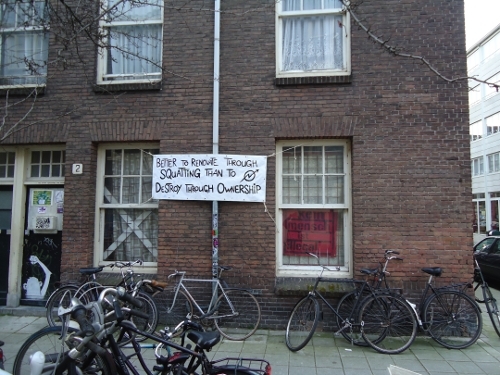 On Saturday February the 8th, two apartments on Sumatraplantsoen 66 and 68-1 were squatted. They are both owned by the housing corporation Eigen Haard. 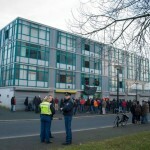 This social housing block is planned for demolition and privatisation, and the corporation has already started relocating the tenants. The local residents are protesting against these gentrification plans. 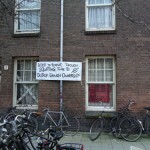 Two days after the occupation, the squatters received the eviction letter, together with their neighbours of the Swamp, Sumatrastraat 232, squatted on December 15th, and also owned by Eigen Haard . Most of the spaces that are being evicted are not put in use afterwards. They either remain empty, or anti-squatters move in. The ‘squatting and vacancy’ law seems to do anything but to create void: surely it is a good business for real-estate owners, and anti-squat companies’ profits are rocketing. While those who fight against gentrification are treated as criminals, the erosion of housing rights, the shortage of affordable spaces is way too low on political agendas. 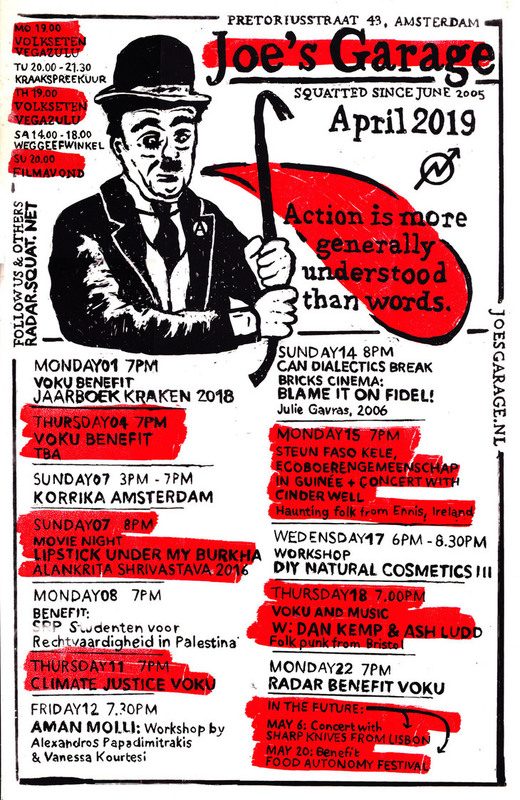 In the last few months Joe’s Garage hosted multiple events and collectives: among others, the Global Uprisings conference, activists from Occupy Gezi and Hambacher Forest, the Greek Re-Inform collective, and the Calais Migrant Solidarity. 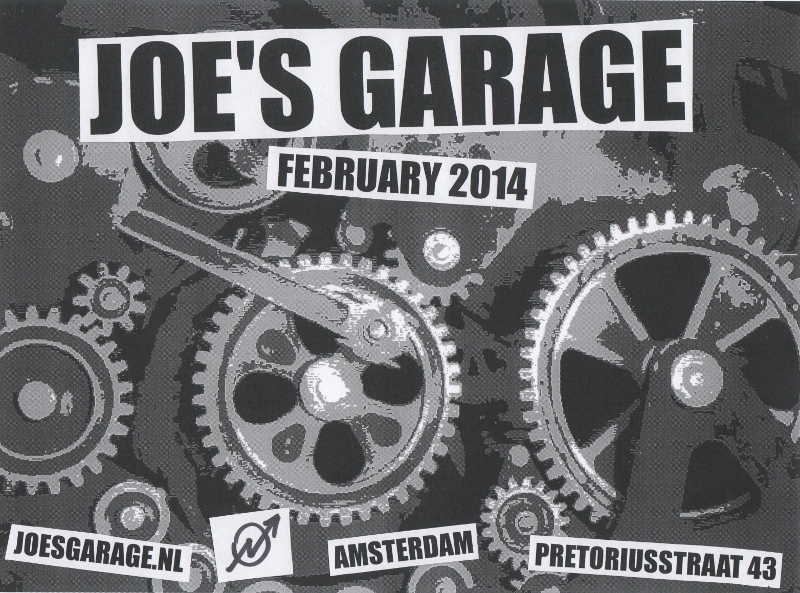 As an autonomous squatted space, Joe’s Garage always welcomes new events, benefits and participants. Get involved and take action with the squat groups of your neighborhood!